Home Care Assistance, a leading provider of senior in-home care in Harrisburg, knows seniors are more likely to suffer from stiffness and aching joints after surgery. This makes establishing a gentle workout routine after surgery especially important. The following exercises can be beneficial to seniors post-surgery regardless of age or fitness level. Because surgery sometimes requires temporary bed rest, patients’ bodies may become more tense, stiff, and achy than usual. Your senior loved one can simply roll his or her shoulders forwards for 5 to 10 repetitions, then repeat the same number of repetitions while rolling the shoulders backwards. Shoulder rolls instantly relieve tension in the shoulder and chest areas. After surgery, it’s important for your senior loved one to perform ankle pumps several times a day for the first few days after surgery. This exercise is easy to do and just requires your senior loved one to extend the foot up and down. Performing ankle pumps regularly will help prevent dangerous blood clots from forming. Performing a stretching routine daily after surgery will help seniors keep their bodies agile. Stretching also helps with the soreness associated with surgery. While lying on a bed, have your senior loved one pull his or her knees to their chest to stretch the back. From a standing position, taking a deep breath and bending over on the exhale will also help stretch to the back. Light walking after surgery can help your loved one maintain a healthy fitness level during recovery from surgery. Walking will also get the heart pumping and cause the body to release endorphins that can boost mood. If possible, encourage your senior loved one to do regular strength training. By lifting light weights or utilizing exercise bands, your loved one can build muscle strength. Strength training can also keep bones healthy and strong. These advantages might prevent the need for other surgeries in the future. 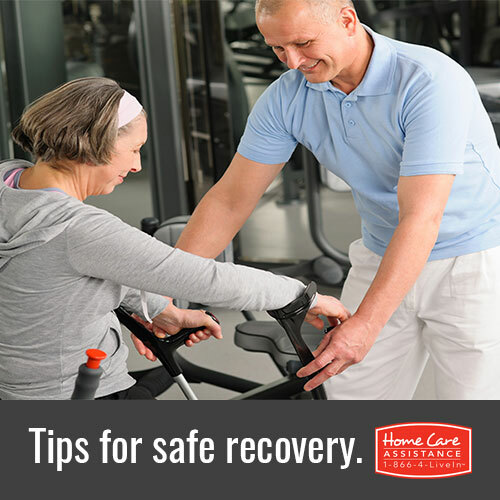 While exercising after surgery may seem difficult or painful at first, it will aid in the recovery process. Be sure to speak with your senior loved one’s physician prior to beginning any new exercises, especially after surgery. Make life easier for your senior loved one post-surgery and find temporary help for him or her through Home Care Assistance. Our part-time Harrisburg caregivers can assist with daily errands, cooking, medication reminders, light housework, and mobility support. Call a Care Manager today at (717) 540-4663 to learn more and schedule a free in-home consultation.